Dr. Demetrios Theodoropoulos is triple board certified with designations in Allergy & Immunology, Pediatrics, and Genetics. He completed an Allergy & Immunology Fellowship at the University of South Florida and a Clinical Genetics Fellowship at the National Institutes of Health. In 1997, Dr. Theodoropoulos was also recognized by the Asthma and Allergy Foundation of America with the outstanding asthma educator award. 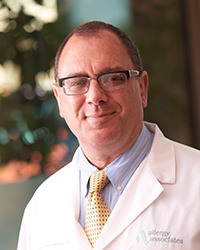 Dr. Theodoropoulos is recognized nationally and internationally for his allergy work including numerous peer-reviewed journal articles. Much of this work has pertained to sublingual immunotherapy, migraine headaches, GERD (acid reflux), and asthma. He enjoys helping patients with these issues and with his broad background, he sees both adult and pediatric patients.